KISS discusses their participation in Guitar Hero 5. The KISS GH5 track pack is available November 19, 2009. Here are a few photos of Shannon Tweed and Amber Thayer attending the KISS show in New Orleans. KISS is headlining the 11th Annual New Orleans VooDoo Fest. Check out Tommy Thayer applying KISS make-up to his wife Amber backstage at VooDoo Fest. Happy Halloween To The KISS Army! Happy Halloween to all of the KISS Army - young and old. Stay safe. Here's an on stage video clip of KISS during "Deuce" in NY at MSG on October 10th, 2009. The Paul Lynde Halloween Special was a Halloween-themed television special starring Paul Lynde whose first (and only) broadcast was October 29, 1976 on ABC. It featured guest stars Margaret Hamilton as The Wicked Witch of the West from The Wizard of Oz, Billie Hayes as Witchiepoo from H.R. Pufnstuf, Tim Conway from The Carol Burnett Show, Roz Kelly from Happy Days, Florence Henderson from The Brady Bunch, rock band KISS, Billy Barty, Betty White and (in an unbilled surprise appearance) Donny Osmond and Marie Osmond. Above, KISS performs "Detroit Rock City", "King of the Nightime World", and "Beth". KISS playing "Say Yeah" Thursday night in Little Rock. The new KISS record is a chamber-pop concept album about the plight of migrant workers. Just kidding. On their 19th studio effort, the glam-rock war horses smear on the greasepaint and blast out odes to rocking all night and partying all day. KISS are a piece of Americana... this big catchy record passes that test. Key tracks: "Never Enough," "All For the Glory." My name is Santiago Corrada and I am the Neighborhood Services Administrator and work for the Mayor of Tampa, the Honorable Pam Iorio. I have been a loyal member of the KISS Army for over thirty years, have met you in the past and have one of those famous KISS rooms. This past Wednesday before the concert at the St. Pete Times Forum, I had the pleasure of presenting you and the other members of KISS with the keys to the City of Tampa on behalf of our Mayor. Please see the picture from the presentation. Again, thank you for coming to Tampa and putting on the greatest show on earth. Tampa loves KISS!!! If you're flying on Southwest Airlines today, don't be spooked if you see Ben Franklin, the Statue of Liberty, Larry Bird or Julia Child along for the ride. Southwest chief executive Gary Kelly is known to surprise passengers and employees with a costume every Halloween, and he practically makes the occasion a company holiday. 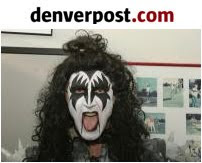 In past years, Kelly has masqueraded as Gene Simmons of the rock band Kiss. In 1977 Marvel Comics published a magazine-format full-color comic book presenting KISS as superheroes. Blood from each band member was drawn by a registered nurse, witnessed by a notary public, and poured into the vats of red ink used for printing the comic at Marvel's Borden Ink plant in Depew, New York. Most KISS fans that own a copy of this sought-after KISS collectible have it hermetically sealed and put away somewhere safe, never to be touched but maybe twice a year. Well, above we have posted a page-by-page picture slide show of the entire comic for your viewing pleasure. All 68 pages of it (including cover and back art). The next best thing to viewing a real copy. If you're fortunate to own one. Look for KISS to headline the Guitar Hero stage on November 19 with a three song track pack that's sure to satiate the KISS fan in everyone. The track pack will feature "Modern Day Delilah," the first single off their new album, Sonic Boom, "Lick It Up," the title track from their 1983 album, Lick it Up, and "I Was Made for Loving You," KISS's second Gold single. KISS Track Packs will be available on 11/19/09 via Xbox Live Marketplace for Xbox 360 for 440 Microsoft Points, on the PlayStation Store for the PS3 for $5.49 and for Wii for 550 Wii Points. In addition, all songs in the KISS Track Pack will be released as downloadable singles for Xbox 360 for 160 Microsoft Points each, PS3 for $1.99 each and Wii for 200 Wii Points each. While you wait, you can also rock out to KISS right now in GH5, which features "Shout It Out Loud!" For more information, visit www.guitarhero.com. In the last two decades or so, the Kiss co-founder has been heavily promoting the band's name and image through a series of off-the-wall products. Did anyone in the Noisecreep Nation purchase a Kiss Kasket? So saying that the band has put a huge importance on the marketing of their brand would be a gross understatement. When it comes to Kiss' early days, Larry Harris, a former Casablanca Records executive, doesn't seem to agree with Gene Simmons's sense of history. In his brand new book, 'And Party Every Day: The Inside Story of Casablanca Records,' the old-school record promotion man talks about his and the label's role in the creation of Kiss' imagery and stage show. If you've seen Simmons in interviews in the last few years, you are already familiar with his stadium-sized ego. In this Noisecreep exclusive, Harris talks to us about Kiss' early days and how their infamous stage shows were originally formulated. 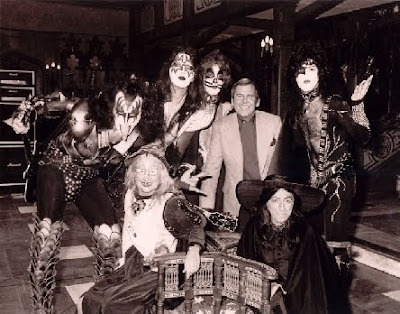 In the book you talk about going to a magic shop with Neil (Bogart, head of Casablanca Records) to try and find some stuff for Kiss' stage show. 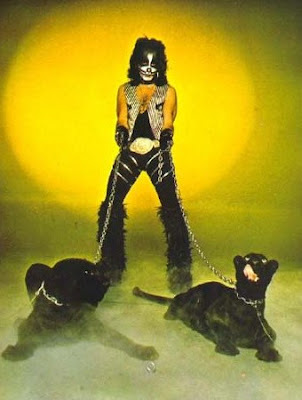 Reading interviews with Gene Simmons through the years, one would think that he and the band came up with all of the imagery. That would be complete bulls---! Their image and stage show was a collaborative effort. There were things that I certainly came up with alone. For one, I was the one that suggested they put their logo on the bass drum. I've always been a big believer of having that to help push the marketing of a group's name. I also went to Gibson Guitars and made a deal with them to get Kiss guitars. All they had to do was throw the company's name on the album's liner notes. After we got those guitars, the guys could smash them on stage and add to their stage show. But yeah, Gene talks a lot, but we all pitched in ideas for the band back then. Didn't Sean Delaney (former Kiss co-writer and solo musician) also help shape their stage show and moves? He totally did. Sean came up with a lot of the stage moves and antics people associate with the band. He doesn't get enough credit for that stuff. He passed away a few years ago. In 1978, Casablanca Records released a solo album for each member of the band. The sales weren't great, and the label lost a lot of money on the promotional costs. Looking back, do you think if one of the solo albums would have been a runaway smash, the band would have splintered off? You know, I have always thought that if Ace Frehley's would have sold millions, he would have left the band for a solo career much earlier. As I explain in the book, everyone expected Paul Stanley or Gene Simmons's solo records to sell the best out of the four guys, but Ace won that one. He had a huge single with 'New York Groove' and that helped him sell more copies. 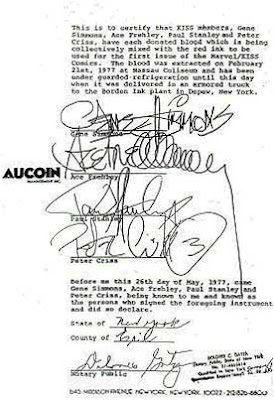 I also think if Peter Criss's sold more, he would have left too. Both of those guys had been discouraged from contributing to the songwriting and singing at that point so they were frustrated. When you go back and listen to the Kiss albums you were part of, which one is your favorite? I think I will say the self-titled debut album. It was the first album we released as Casablanca Records, and we were all so young and optimistic about the future. The band put together a great record and everyone at the label was excited to be working it. Unrelenting torrential rain wasn't enough to dampen the spirits of three generations of KISS fans who celebrated through an 18-song concert in an atmosphere that resembled some unholy combination of Halloween and the Fourth of July. Most impressive was the set list. Kiss played two songs from the new album, one from the no-make up days (the title track to 1983's "Lick It Up"), and only one other post-1977 tune ("I Love It Loud," one of the signature tracks off the highly underrated "Creatures of the Night" from 1982). Otherwise, the band mixed hits with excellent deep cuts. Among the most well-executed numbers were Tommy Thayer's handling of "Shock Me," as well as the triple assault of relics "She," "Parasite" and "100,000 Years," which included a rudimental, yet explosively entertaining drum solo by Eric Singer. After closing the set with "Rock and Roll All Night," and a blizzard of confetti, Kiss delivered the four-song encore of "Shout It Out Loud," "Lick It Up," "Love Gun" (with Stanley being delivered Tarzan-style to a mini-stage at the back of the arena), and the signature anthem of any Kiss show, "Detroit Rock City." But the allure of a Kiss show is, at the end of the day, pure spectacle, plain and simple. With enough fireworks, pyro and lighting to pinpoint our exact location from Mars, state-of-the-art video and projection screens and trademark fire-breathing and blood-spitting antics from Gene Simmons, Kiss delivered the goods. Video: Ace Frehley At The Nokia Theatre In L.A. Here's some great fan filmed footage of Ace Frehley playing the Nokia Theatre in L.A. on October 28th, 2009. Above is "Snow Blind", "Sister", "Rocket Ride", "Parasite", "Outer Space", and "Shock Me". Notice that Ace's band members are all donning the "Spaceman" make-up during their show. Set list : Rocket Ride, Parasite, Outer Space, Snowblind, Sister, Speedin' Back To My Baby, Shock-Me, Love Gun , Gold Gin / Black Diamond Outro. Jondie and Rebecca Davis have turned their home on West Main Street in Franklin into "KISS House." They'll have two tribute bands performing in the yard on Saturday for trick-or-treaters. Invited guests at the Davis house are asked to bring two bags of candy. Rebecca Davis said she expects to hand out candy to about 2,000 trick-or-treaters. Olivia Davis helps her dad, Jondie, get into his Kiss costume. Jondie Davis said he's been a fan of Kiss since he was 9 years old in 1977. Audrey Davis, 4, watches as her mother, Rebecca, applies makeup to her sister, Olivia, 10. The Davis family is dressing as the rock band Kiss for Halloween and have decorated the front of their Franklin home to look like a stage. Check out this great 'Creatures of the Night' inspired poster for the Arkansas Roller Derby's October 17th event. Spanish magazine "Heavy Rock" has KISS on the cover this month. 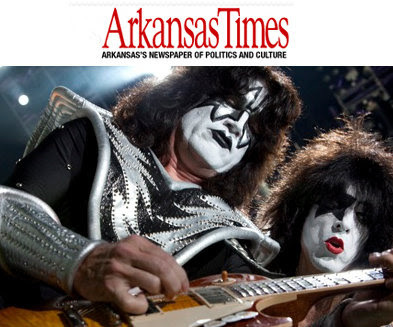 The magazine includes a review of the New York concert and an interview with Tommy Thayer. DESPITE announcing more ''farewell'' tours than John Farnham, Kiss continue to sell out shows around the world. 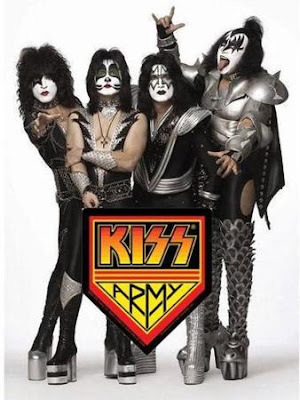 But it's the 30-year-old classics the Kiss Army now screams for. And with Gene Simmons being so unashamed about ''only being in it for the money'', Kiss' creativity appeared to have dried up. But Kiss have defied convention and their first album since 1998's average Psycho Circus is a return to form. 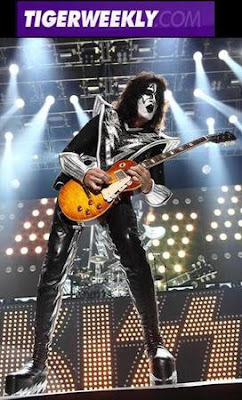 The revival can be attributed to guitarist Tommy Thayer, who has taken on the silver, black and white space trooper make-up of troubled former axeman Ace Frehley on album No. 19. Thayer writes, sings and plays some of the band's best riffs in years on Modern Day Delilah and I'm an Animal, which seems to be inspired by MC5 song Call Me Animal. Of course, the lyrics are beyond Spinal Tap but that's all part of the fun. Simmons has become a caricature of himself and on Hot and Cold, he leaves nothing up to the imagination when he invites the listener to ''feel my tower of power''. Silly and cliched but spirited and darn good fun. Here is fan footage of Ace Frehley performing "Outer Space" live at the Nokia Theatre in L.A. on October 28th, 2009. Ace and his band opened up for Alice Cooper on this bill. Notice that Ace's guitarist Derrek Hawkins, his bass player Anthony Esposito, and his drummer Scot Coogan all have the "Spaceman" face make-up on. 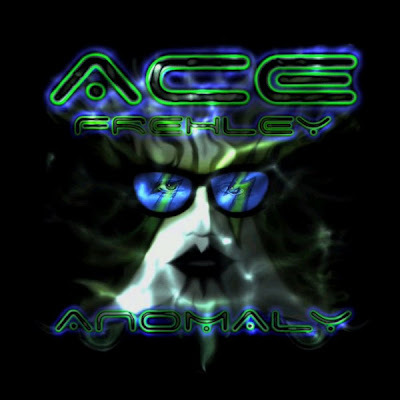 Ace's new solo album "Anomaly" is in stores now. On the heels of Sonic Boom, their first release in eleven years, KISS, the masked marvels of rock and roll, arrive in New Orleans just in time for Halloween with a spot in the VooDoo Experience lineup. While longtime KISS Army members have an idea what to expect, first-time concert goers just need to remember to heed the warning and buckle up and hang on for the ride when that curtain drops at New Orleans City Park. Original members Paul Stanley and Gene Simmons, sporting brand new costumes and their classic seven inch leather heels, lead the bombardment, along with guitarist Tommy Thayer and drummer Eric Singer. One of KISS's mottos has always been, "If it's too loud, you're too old!" says Stanley, "At this point, with the legend of KISS, there really is a sense of a band that has always delivered 100% and tried to deliver more. And there's a young audience that has heard about us and wants to see if that's true. They find out - deafeningly and blindingly - that it is. I think it's timeless. The members of KISS, the iconic figures, are timeless. And that's intriguing." So don't hide your eyes when Simmons blows fire or dribbles fake blood from his mouth and then proceeds to fly to the top of the lighting truss, and don't duck when Thayer's guitar shoots off fireworks. The God of Thunder himself told RockRadio.com, "If you bring your eyes to a concert, we want a visual boom, a visual overload. And you should get that. New outfits, brand new stage, millions more put into it -that's the history of Kiss. Simply put, any band you go to see for the same ticket price, you know, Kiss is gonna give you tenfold more. That's just a statement of fact. And there's a new screen, state-of-the-art; I don't think people have seen this kind of thing before - that's literally as wide as the entire stage. So, there ain't a bad seat in the house." Thayer and Singer have replaced Ace Frehley and Peter Criss respectively and are decked out in stage makeup and updated versions of the Spaceman and Catman costumes. With regards to being the current cat, Singer told NorwichBulletin.com, "It's a lot of work and a lot of responsibility. People have this misconception that it�s all fun and games, and some bands do just get out there and play. But there are higher expectations for a KISS show. KISS is a spectacle. It's the circus meets rock 'n' roll. Gene and Paul have always said when they created KISS, they created the show they never got to see. We've got to turn them on visually as well as musically." And while some longtime KISS fans will always long for the day of the original members all together on stage again, Stanley seems very pleased with the chemistry of this current lineup. As he told Montreal radio station CHOM-FM, "You can't fake chemistry. You can't really make something that's real unless it's real. This band is deadly. It'll put a smile on your face but it will also knock you to the ground." And that they do. The U.S. leg of this Alive 35 Tour, celebrating the long history of the band, began with two nights in Detroit where the band unveiled its new stage set which Stanley told Billboard.com is "the widest, biggest stage we've had," featuring a massive HD screen above it, three levels of lighted cubes at the rear, and two video screens and huge KISS Army banners flanking it. Hydraulic lifts bring the band members up from below the stage level at the beginning of the show and set them above the crowd while confetti swirles and more pyrotechnics explode at the end of "Rock and Roll All Nite." Simmons told Billboard.com, "So many things in life are not real. Santa is not real. Superman is not real. KISS is real. And we're going to make sure that when you leave that show, your first KISS show or the 100th, you'll walk away, whether you love the band or not, and say, 'That is the best thing I've ever seen on planet Earth.' That's a vow we make to ourselves and anybody who's willing to come out there and see us." Much of the set list features songs from the 70s Alive! and Destroyer era, including "Deuce," "Strutter," "Detroit Rock City," and "Shout It Out Loud," and many others during the expected two and a half hour show. KISS is certainly no stranger to The Big Easy. Along with regular stops during their previous tours, they served as the Grand Marshalls of a Mardi Gras parade back in 1979 while more recently Simmons was a guest and rode on a special float in a 2005 parade. KISS has also performed at various venues over the years including shows during the 70s at The Warehouse and the Municipal Auditorium. Of course, they've seen the inside of the Super Dome as few times as well. "You wanted the best, you got the best. The hottest band in the world... KISS!" 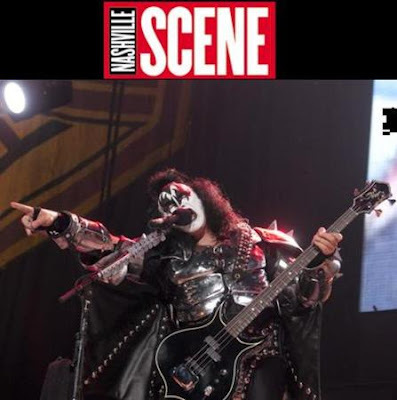 KISS Makes Music City "Rock City"
Even with Halloween just a few days away, there was no question why the freaky makeup-wearing masses had descended on lower Broadway in Nashville. Kiss was in town. The hard rock vets brought their trademark blend of costumed camp, ear-splitting riffs and explosions to the Sommet Center Wednesday night, and a full house howled in approval of every triumphant pose, double entendre and pyrotechnic burst. After 35 years, the band's stage presences much like their set pieces seems to run like clockwork. It wasn't long after the opening one-two punch of "Deuce" and "Strutter" that frontman Paul Stanley and bassist Gene Simmons were side-by-side at the foot of the stage, preening for the photographers below. Of course, that was one of the simpler spectacles of the evening. Soon, the band's famed theatrics and special effects took center stage. As Stanley had promised The Tennessean earlier this week, they'd brought all their iconic tricks along giving some a modern, super-sized twist. The band has long been known to perform in front of a gargantuan wall of guitar amplifiers, purely for cosmetic purposes. They've only gotten shallower with age. Wednesday's amps were actually speaker-shaped video screens that frequently projected images of the member's faces and classic Kiss album covers. Speaking of faces, there were a pair of them in the band's ranks that might have been a little less familiar to the audience, makeup and all. 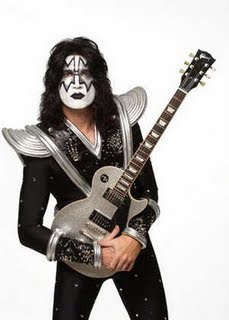 Guitarist Tommy Thayer and drummer Eric Singer are essentially playing the parts of original members Ace Frehley and Peter Criss, who both finished their most recent runs with Kiss in 2002. The two have adopted Frehely and Criss's makeup and costumes, and Thayer even went so far as performing "Shock Me," a song originally sung and written by Frehely. But neither the casual showgoers or diehards seemed to have any objections to the new guys playing dress-up. Both endeared themselves to the crowd through their solo turns (each band member got the stage to themselves at some point) particularly Singer, who stick-twirling flair was well matched with the spinning drum riser that propelled his drum solo. Still, Stanley and Simmons were held in another league of regard, and deservedly so. Stanley was a relentless milker of audience enthusiasm, addressing the fans between nearly every song and imploring them to get as noisy as possible. "I know this is Music City. I don't want to make it too loud for you," he taunted before launching into "Parasite". At 60, Simmons is the band's oldest member, but might also be the most well-aged, on-stage, at least. There's something timelessly cool, menacing and plain fun about his "Demon" persona and getup. His solo turn, amidst a torrent of fog, was obviously the most anticipated moment of the evening. As his bass rumbled, he mugged for fans' flashbulbs before spitting up fake blood, ascending to the ceiling on wires and performing a song on top of the lighting rig. It's a good bet that it was a first for the Sommet. As the band's main set came to a end, Stanley explained to fans that if they expected the band to make any political stances on stage, they had come to the wrong show. Instead, the band closed by urging fans � as they had done for the last three decades � to "Rock and Roll All Nite." After the confetti cleared and the band had taken their bows, Stanley announced that the band wasn't through yet. They launched into a lengthy four-song encore that kicked off with "Shout It Out Loud" and "Lick It Up" (the latter of which included a surprising tease of the Who's "Won't Get Fooled Again".) Stanley swung over a thrilled crowd on a wired apparatus to a small, rotating stage at the other end of the room to take on the band's 1977 classic "Love Gun." Closing the evening with "Detroit Rock City" and a barrage of flames, fog and sparklers Stanley saluted the Nashville audience one last time. "Tonight, you're not just a city," he said. "You're a rock city." "Hello everyone. Off to the big Chiller Theatre Toy, Model & Film Expo in NJ. this weekend! Will be exciting to be back east for the weekend. Please come by if you are in the area and stop in to say hello to me. Some amazing stars from the entertainment world are always present. 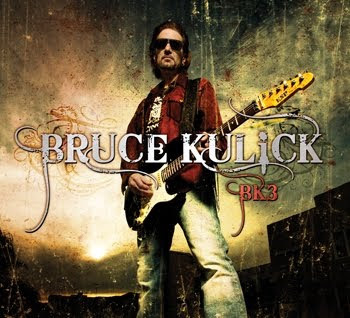 Official news is coming soon on the release and distribution of my BK3 CD, so thanks for all your patience. Can't wait for you all to hear the music and hold the awesome digipack designed package. Until then, be sure to check out the BK3 Page here on Kulick.net for the full track listing, BK3 themed desktop wallpapers, my Making of BK3 Studio Blog, and other information. Fan filmed footage of KISS playing "Strutter" at the Sommet Center in Nashville, TN. OK, we get it: We're Nashville and KISS loves us. Paul Stanley reminded us of that ad nauseam last night at the Sommet Center, where we de-virginized ourselves of the KISS concert experience. How was it? It was exactly what we expected: a totally awesome, face-melting onslaught of gargantuan camp, fire, galloping riffs and fist-pumping shout-alongs. We came to see all those things, and we got what we wanted: the best. As we waited for "the hottest band in the world" to take the stage, we milled around to observe the KISS Army in action. Par for the course, it really did seem like one out of every four or five people we saw had KISS make-up on. In fact, there were even booths where a make-up technician would airbrush a KISS character onto your face. Followers of the cult mixed and mingled with your garden-variety heavy metal parking lot crowd, creating a festive rock 'n' roll all night atmosphere. Not bad for a Wednesday. These people all lost it when the lights went down and--with a startling blast of pyro--the curtain dropped, revealing the band in all their iconic glory, as they went head first through a one-two punch of "Deuce" into "Strutter"--two of our favorite KISS gems. Right off the bat, the show spared no clich', and we mean that in a good way. We didn't come to the KISS show to use our right brains, we came to let go of our inhibitions and be entertained--and entertained we were. Let's go down the list. Pyro in the chorus and big finish of nearly every song? Check. The platform shoes and black spandex? Check. Gene Simmons spitting fire? Check. Gene Simmons coughing up blood? Check. Spotlight guitar, drum, and bass solos where all other members leave the stage? Check. A spinning drum riser? Check. Bottle-blondes in the audience flashing the band? Check. We even got Gene Simmons singing "I Love It Loud" on a platform atop a lighting rig that he levitated to. Not to be outdone, Paul Stanley took flight over the audience to his own platform to sing "Love Gun." Between all these shenanigans we got all the classic KISS moments with which they defined the arena-rock experience. And, of course, there was the make-up. 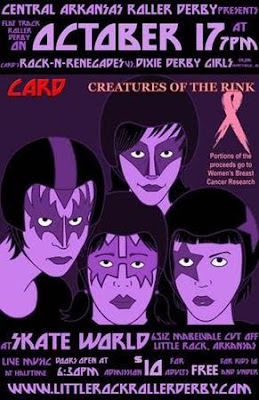 We'll just get it out of the way--founding members Peter Criss (drums) and Ace Frehley (lead guitar) are not in the current incarnation of KISS, but their trademark Catman and Spaceman make-up designs are now donned by their replacements. For many in the KISS Army this is a deal-breaker, but obviously not too many as, while not sold out, the arena appeared damn near close to it. Just as the stage production left little to be desired, so did the '70s-centric setlist, which featured nearly all of the band's most recognizable hits, from "Hotter Than Hell" to "Calling Dr. Love," "Black Diamond" to "Lick it Up" and the inevitable "Rock and Roll All Nite." They even played a bit of "Stairway to Heaven." KISS is easily the rock show equivalent of a Ringling Bros. three-ring circus. After a straight two hours of both ironic and un-ironic headbanging, we praised all might rock 'n' roll as the lights came up to reveal an arena smokier than a Southern California wildfire. Some listeners may think of the band KISS as a '70s and '80s band, but KISS is perhaps more alive today more than ever. With a new album Sonic Boom and a hungry group of new young fans, KISS pushes on as one of the biggest names in rock 'n' roll and in pop culture in general. KISS will headline Voodoo Fest on Halloween Day with makeup on and guitar amps cranked. And it seems there is no more fitting time to see KISS, either for the first time or the fiftieth. The crowd should be filled with everything from young fresh KISS fans to the old school loyal devotees. 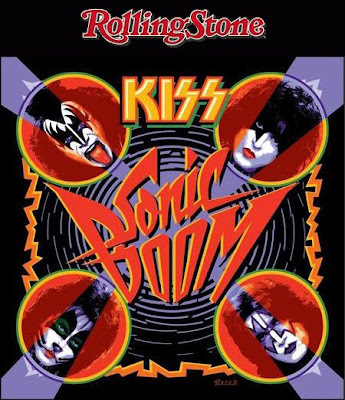 With the new album Sonic Boom already selling very well and the KISS "Alive 35 Tour" selling successfully, it seems as if KISS is just getting started. In a phone interview with KISS member Tommy Thayer, the guitarist talked about this sentiment. "We are excited about coming down to Voodoo Fest; New Orleans is quite the party time," said Thayer. "We know that Halloween is gonna be a crazy night. It's the perfect night for KISS. It can be more explosive when we have a more limited time scheduled for our set, but we still pack in all the heavy artillery, and this will be no exception and we'll blow the place up." "The main thing we want people to know is that the record hit the stores and its an amazing record," he added. "It's rock 'n' roll at the core, and it's doing real well so far. It's hitting sales records...Kids see KISS and are immediately captured by the appeal, the sound, and the new look, its kind of a perpetual thing. There has been a resurgence of KISS fans. We noticed it in Europe last summer; we looked out into the crowd and it was all young kids." 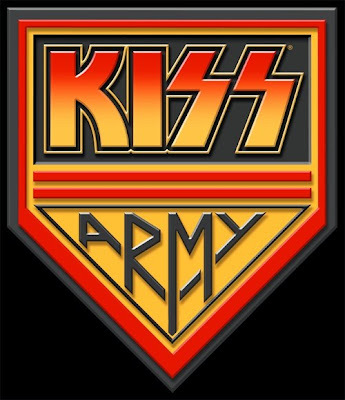 At KISS's official Web site, listeners can click on a link that enables them to become a member of the KISS Army. Once a member, fans can sign in, post and upload videos, update their blogs, and find whatever KISS memorabilia they are looking for. On the new album, Thayer said, "It's a rock 'n' roll album in its purest form. We call it 'no filler all killer.' It's gutter rock 'n' roll. There's no ballads and it's all in your face, and that's something that appeals to everyone and that's why Zeppelin and the Beatles live on because it's a timeless sound. All four members are very integral [in the recording process]. We rehearse the songs and record them all together, which is rare these days. Everyone has contributed to this record." Three day passes to see KISS and all the other acts at Voodoo Fest are available at www.thevoodooexperience.com. For more information on KISS and their upcoming dates, visit kissonline.com. KISS will play the Voodoo Stage at Voodoo Fest on Saturday, Oct. 31 at 9 p.m. The big KISS Fan Expo in Kuurne, Belgium takes place this Sunday, November 1. KISS fans from around Europe with gather to celebrate all things KISS! Special guest will be Lydia Criss, who's bringing along an exclusive version of her book 'Sealed with a KISS'. KISS merchandise dealers from around the world will also be attending and selling everything KISS! KISSONLINE will be attending the EXPO....please stop by our booth and say hello! - Dress up Halloween style and get in free for the evening KISStory concert and the afterparty! Further information can be found at www.kisstory.be. Here's KISS featured on the cover the new issue of the Italian 'ROCK STAR' Magazine. Although their long locks were far from military muster, members of the iconic rock act KISS were warmly welcomed at the Charlie Norwood VA Medical Center today. The band, best known for its overtly theatrical hard rock shows, invited veterans and service members from the Augusta-based Wounded Warrior Projects CSRA program to its Atlanta concert Monday night, and followed up the show with a VA visit Wednesday before jetting to an evening gig in Nashville..
Three members of the band, guitarist Tommy Thayer, drummer Eric Singer and lead singer/guitarist Paul Stanley made the trip. Bass player Gene Simmons was unable to attend due to a prior engagement. Mr. Stanley, a founding member of the nearly 40-year-old act, was clearly touched by the opportunity to share time with the hospital's staff and patients. "We're honored to be here with you people," he said, addressing the large crowd assembled in the rehabilitation room. "We're here for you. God bless you all." Mr. Stanley said it was important to KISS, as a band, that the service men and women who are injured in the line of duty receive the respect and attention they deserve. Success, for the highly successful band, means ensuring that happens. "People talk about the ultimate sacrifice," he said. "But isn't it a sacrifice to come back home and discover you no longer have your life? We want everyone home safely and to urge everyone to give these people the respect they deserve." Stephen Ogles attended the event with his face painted with Gene Simmon's distinctive design. Mr. Stanley joked that he could be in the band, but he's a little too young. The wheelchair-bound Mr. Ogles said staff at the VA helped him prepare to meet KISS. "I've been a fan of the boys for a lot of years," he said quietly. "I like that they came down." Leonel Orozco left the event sporting a Paul Stanley-signed eye patch. He admitted that he had not grown up listening to KISS, but now considers himself a member of the KISS army. "I really wasn't a fan at all," he said with a laugh. "I think I knew one song. But that concert made a fan out of me. They treat their fans really well and they are, I think, our biggest fans." After meeting fans, signing autographs and taking pictures, the band took a short tour of hospital units, including its innovative kayak rehab center. Mr. Stanley said that as well as bringing a little joy to the patients, he hopes the KISS visit might bring attention to the Charlie Norwood VA Medial Center as well. "You have this amazing facility here and it's almost a secret," he said. "It shouldn't be a secret. It should be a model, the template for facilities like this." Paul Stanley poses for a picture with Jasper Stewart at the Charlie Norwood VA Medical Center in Augusta, Wednesday, Oct. 28, 2009. Stewart painted his face with a star just like Stanley wears when he performs with KISS. Paul Stanley, Eric Singer and Tommy Thayer, pose for a picture with Stephen Ogles at the Charlie Norwood VA Medical Center in Augusta, Wednesday, Oct. 28, 2009. Ogles painted his face like the band does when they perform. Mr. Eric Singer during his drum solo in Nashville on October 28th, 2009. Tommy Thayer during his guitar solo in Nashville on October 28th, 2009. Gene Simmons spitting fire at the Sommet Centre in Nashville, TN on October 28th, 2009. Don't try this at home, kids. Seriously. 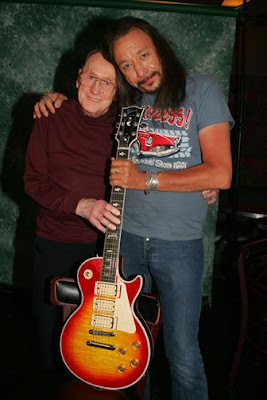 Ace Frehley will be attending a very special tribute to the late, great Les Paul to be held at the historic Ryman Auditorium, former home to the Grand Ole Opry, in Nashville on Thursday, November 19, 2009. The tribute concert program will be free to the many fans of Les Paul and Gibson Guitar. Joining Ace Frehley for the show will be rock’s elite including Steve Miller , Zakk Wylde, Charlie Daniels and Jennifer Batten. Joining them will be contemporary artist Josh Kelly and Nashville’s own country hit-makers John Rich, Emerson Drive, JD Souther and Steve Wariner. NY Jazz artist Sarah Partridge will perform a special rendition of Les’ own version of Somewhere Over the Rainbow while Anna Wilson will take the stage to perform her personal jazz remembrance. Click HERE to get your tickets to the Les Paul Tribute at the Ryman in Nashville, Tenn. On Thursday, November 19, 2009! ATTN: KISS ARMY - Are you ready to rock? Broadcasting from the campus of Montgomery County Community College in Blue Bell, PA, MONTCO RADIO presents a HALLOWEEN TRIBUTE TO KISS! At 5PM EST on Friday, October 30, following the "ELITE THREE" show, MONTCO RADIO will begin it's special HALL-O-WEEKEND programming, which will include tons of KISS, plus other Halloween themed music. MONTCO RADIO's special Halloween programming will be the perfect background for all of your Halloween fun, so tune in and turn it up! For more information and to listen click HERE. Some of Augusta's Wounded Warriors got to go see KISS, in Atlanta, on Monday night, but for those who couldn't, KISS came to see them. Wednesday, some of the band members stopped by the uptown Augusta V.A. Medical Center, on Wrightsboro Road. 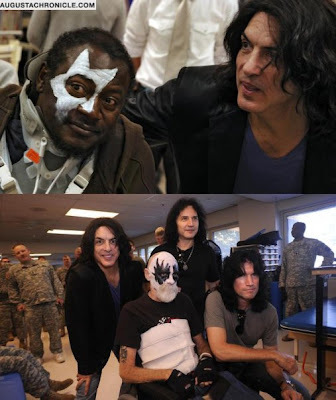 Paul Stanley, Eric Singer, and Tommy Thayer (Gene Simmons had a prior engagement) took photos, signed autographs, and just said 'thank you' to veterans who were injured overseas. It was a big day for those veterans, but Stanley says, it's also a big day for the band. Ace Frehley And Alice Cooper Tonight In L.A. Ace Frehley will perform with legendary rocker Alice Cooper tonight, October 28th, at the Nokia Theatre in Los Angeles. He'll spend a night in KISS and then tell a Saskatoon audience about his success in business. Saskatchewan Young Professionals and Entrepreneurs (SYPE) has landed Gene Simmons as a luncheon speaker the day after his band's concert in Saskatoon. "We're pretty pumped about it," SYPE's Saskatoon president Janea Bellay said Tuesday. "He knows business. He knows marketing. He's an entrepreneurial icon of our time." The organization had Simmons on the wish list for its Leadership Series, then learned of the Saskatoon concert on Nov. 10. "We thought, 'Now's our chance to do it,' " said Bellay. SYPE got the booking with the help of tinePublic Inc. of Calgary, the same company that brokered the recent visit of George W. Bush. It's also handled Bill Clinton, Lance Armstrong, Donald Trump and the Dalai Lama. "This is a real coup for them to have Gene Simmons at their event," said Andy McCreath, co-founder of tinePublic and a University of Saskatchewan alumnus. "He's become an extremely successful businessman. He kind of covers all realms," McCreath added. Simmons will speak on the power of creativity and branding. McCreath and partner Christian Darbyshire have developed a connection with the long-tongued bass player, to the point where they were guests at his home in Los Angeles. "It was pretty neat. We spent the day with him and it was lots of fun. He's a really down-to-earth, nice guy." Bellay couldn't get tickets to the sold-out concert but will be part of a VIP meet-and-greet with board members and sponsors before the luncheon. "It's going to be very exciting," she said. Local business sponsors pitched in to reduce the expenses for the organization, Bellay noted. "The Saskatoon business community is fantastic when we put on events of this calibre." In honour of Remembrance Day, the event will include a special tribute to Saskatoon's war veterans. Bellay expects to sell all 1,200 tickets. "We've had phone calls from people I didn't even know were involved with SYPE saying, 'I can't believe there's tickets available.' "
Here is some fan footage of KISS in Atlanta on October 26th, 2009. Former KISS drummer Peter Criss On "FOX & Friends" spreading the word about male breast cancer. 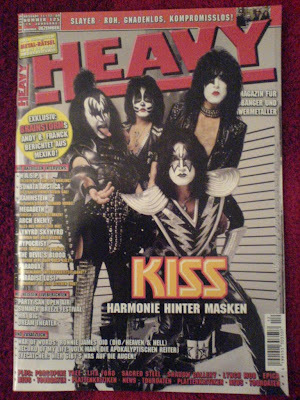 KISS on the cover of German rock magazine "Heavy". Our celebration of all things “Sonic Boom!” Thanks to our friend Alex (BagBoy on the forums), Ken was able to land a great interview with artist extraordinaire Michael Doret. Mr. Doret spoke at length about his involvement with KISS, from the days of “Rock and Roll Over” through 2009’s “Sonic Boom” album. 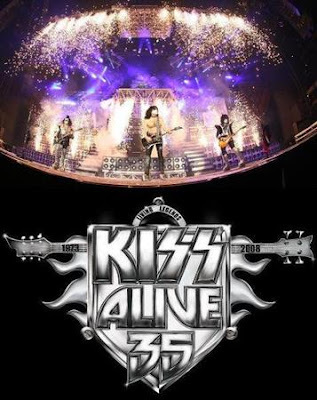 Plus, we bring you our exclusive coverage of KISS’ triumphant 2009 residency at KISStoric Cobo Hall in Detroit. Live and studio rarities… insights and interviews… it’s all here! And if it’s too loud, you’re too old! Here's a few photos of the guys in Atlanta, signing this fan's awesome Mt. KISSMORE Tattoo! 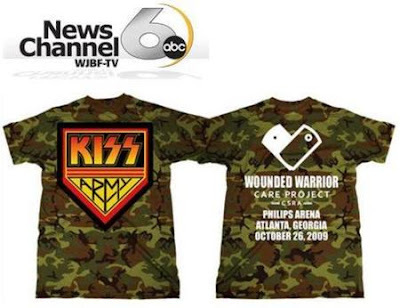 Some local Wounded Warriors got to rock and roll all night with a different Army... the KISS Army. Some of those Wounded Warriors, based in Augusta, were special guests of KISS at the band's show in Atlanta, Monday night. At the concert, the band sold the shirts that mentioned the Wounded Warrior Care Project CSRA, with 100 percent of the proceeds going to programs to help service members in Augusta.